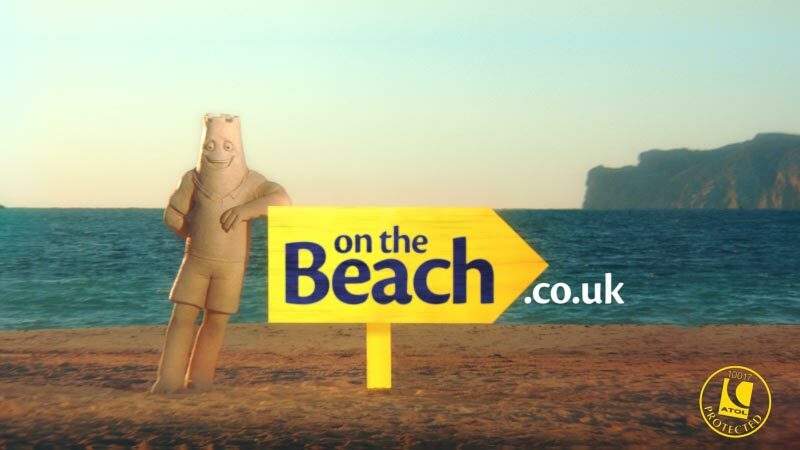 On the Beach is an award-winning UK holiday retailer that connects beach lovers with seaside resorts across Europe. dock10 was asked to fully post produce On the Beach’s latest campaign featuring Mr Beach—a fun loving man of sand who enjoys building sand castles, jet skiing and playing Frisbee on holiday. The commercial called for a lot of subtle touches that would collectively make a big difference to the finished film. Whilst in pre-production, it was quickly understood that VFX supervision on the shoot was imperative to ensure that shots were set up in ways that would eventually save time, effort and expense in post production. Working closely with advertising agency Cheetham Bell JWT, dock10’s VFX supervisor Jim Solan accompanied Production company Stink, and Director Owen Trevor, on the shoot to Palma, Majorca. For one scene, a wire was used to land a Frisbee precisely on Mr Beach. Jim was able to ensure that the wire and the shot were arranged to require minimum clean up. Mr Beach also takes to a Jet Ski, and to add realism and humour the client requested sand to spray from his head as he whizzes over the waves. Jim was able to track Mr Beach’s head to simplify the process of adding a steady flow of CGI sand. As well as visual effects and shoot supervision, dock10 also provided audio, online editing and versioning. Anna Woods, Agency Producer at Cheetham Bell JWT, commented "it was great to get a full post production service from dock10. From initial creative and technical discussions, all the way through to all deliveries to TV and Media stations, we had an experienced, friendly and enthusiastic team working with us and our client." The commercial was launched on Boxing Day 2017.